Omega-3s are Essential for Cats and Dogs! No doubt you’ve heard of Omega-3 fatty acids, Omega-6 fatty acids, and essential fatty acids. You may even take them yourself. But did you know that they are essential for pets, too? The term “essential” means that the body cannot manufacture the nutrient, but must obtain it in the diet. For example, humans and dogs can make Vitamin A out of beta-carotene, but cats must consume pre-formed Vitamin A directly from their food. Among fatty acids, arachidonic acid is essential for cats but not for dogs; while certain Omega-3s and Omega-6s are essential for both. Omega-3s generally are anti-inflammatory, while Omega-6s (the most common in both human and pet diets), can actually promote and increase inflammation when there’s too much of it. Omega-6s are abundant in vegetable oils and animal fats. What do essential fatty acids do? First, they are critical during fetal development, especially for the nervous system and heart. They are incorporated into the membrane of every cell in the body. They are precursors to many important hormones and other compounds in the body. Lack of a healthy balance of essential fatty acids is linked to many serious health conditions, such as allergies, skin diseases, obesity, cancer, insulin resistance, diabetes, asthma, arthritis, autoimmune diseases, behavioral issues, and cognitive dysfunction (senility). Pet foods typically utilize leftovers and by-products of the human food industry. In the U.S., livestock and poultry are fed large amounts of corn, which shifts their natural Omega-3 content to mostly Omega-6. Pet foods typically contain large amounts of Omega-6s, and little or no Omega-3s. Some pet foods now add and list Omega fatty acids in their guaranteed analysis, but this may not be a true reflection of the actual content. Omega-6 is often listed as a guaranteed minimum (meaning there may be–and probably is–much, much more of it in the food), while the minimum guaranteed Omega-3 is usually the most that is present. Some labels are manipulated to create an “ideal” ratio of 5:1 or less, but it’s a good bet that your pet will still benefit from additional Omega-3s. In the body, the forms of Omega 3 needed are EPA and DHA. Because our pets cannot convert plant oils (such as flaxseed or hemp oil) into EPA and DHA to any significant extent, marine oils are the best way to supplement dogs and cats with essential fatty acids. The best fish oil supplements come from wild salmon (not farm-raised salmon) or non-predatory fish such as anchovies or herring. They must be purified to remove heavy metals and other contaminants. Unfortunately, most fish and cod liver oils made for human consumption add flavorings such as lemon, orange, strawberry, mango, or peach. While manufacturers claim that these flavorings are “natural,” the definition of natural flavors is extremely broad and may include things that most of us would rather avoid, including MSG and genetically modified products. And while you’d think that, with their reputation for loving fish, cats would also love fish oil, the taste is just too strong for most kitties. Start very small when introducing these products to your cat. • Cod liver oil is an excellent source of EPA and DHA, but most manufacturers add large amounts of extra vitamins A and D, which can quickly reach toxic levels in small pets like cats. • Predatory, cold-water fish such as salmon and tuna are at the top of the food chain; so environmental contaminants become concentrated in their fat. Farmed fish, particularly salmon, are fed a cocktail of chemicals, pesticides, dyes, and antibiotics; and they live in inhumane, crowded conditions in polluted water. (See Why Fish is Dangerous for Cats for more about farmed fish.) The most sustainable fish oil supplements come from small, fast-reproducing fish such as sardines, anchovies, and herring from the Atlantic or southern Pacific oceans. • Many less-expensive fish oil capsules contain mostly filler oils like sunflower or safflower oils; or even worse, GMO soybean oil. These are loaded with Omega-6s, which largely negate the benefit of the Omega-3s. All oils, but Omega-3s in particular, are easily oxidized (made rancid) from exposure to light, heat, air, and moisture, and they naturally degrade over time. Rancid oils are not only lacking in beneficial properties, but they are actually dangerous to consume: they contain large amounts of inflammation-causing free radicals, and are known to destroy fat-soluble vitamins. The safest and freshest fish oil and cod liver oil products are from Nordic Naturals. They make several products for pets: Pet Cod Liver Oil (liquid), Omega-3 Pet (liquid), and Omega-3 Pet (capsules). But keep reading for more options! Krill are small shrimp-like crustaceans that live in the coldest waters. They are a major food source for whales and other marine mammals, fish, and birds. Krill oil contains EPA and DHA comparable to fish oil. Krill oil proponents claim that since krill make up one of the largest biomasses on the planet, they “can’t” be over-harvested. No doubt, there are a lot of krill in the sea, but unfortunately they are being harvested in the same areas that whales, fish, seabirds, and other animals feed, without concern for sustainability. Whales and penguins are already being affected by this irresponsible harvesting. For example, new research shows that in the Antarctic, every single one of the Adelie penguin chicks hatched in 2015, and all but 2 chicks in 2017, starved to death because there wasn’t enough krill in the part of the ocean where the parents feed to sustain them. Read the article here. For this reason, we cannot recommend krill oil. Certain species of algae naturally produce DHA. Some species have been genetically modified to also produce EPA, although such products typically contain significantly more DHA than EPA, making it less anti-inflammatory than other Omega-3 products. For vegetarians and vegans, this is a great option; but cats and dogs need animal-sourced oils for maximum absorption and utilization. Moxxor also contains folate, and the antioxidants lutien and zeaxanthin. Best of all, the capsules are tiny compared to fish oil and krill oil products (see photo); and some cats will even eat them as treats. Compared to fish oils, Moxxor may seem less potent. 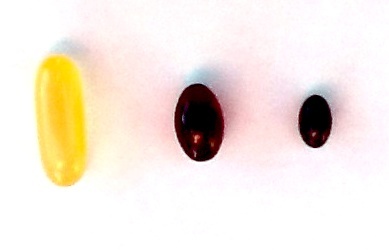 Indeed, a capsule contains only ~350 mg of EPA/DHA, compared to 1000 mg or more for fish oil capsules. However, in my experience, Moxxor is far more bioavailable and biologically active. Because it contains all 18 known Omega-3s, it has benefits far beyond just EPA and DHA. There has been almost no research on any of the other 16 components, but one of them, ETA, has been shown to have far more anti-inflammatory activity than EPA. It’s usually simplest to mix the oil with wet food (canned, raw, or homemade); capsules can be punctured with a pin and the oil squeezed onto the food. However, not all pets appreciate the strong taste of fish oils, so to prevent turning them off completely, start with just a drop or two, and work up to the full dose gradually. Moxxor has the advantage here as well, as the taste of green-lipped mussel oil is much milder than most fish oils. The first benefit you’ll see from Omega-3 supplementation will be an improvement in skin and coat health; you’ll likely see this within just a few weeks. But it’s the benefits you don’t see—healthier cells, less inflammation, a stronger immune system, and a more efficient nervous system—that will make the biggest difference in your pet’s health and well-being! ← Fluoride in Pet Food — A New Danger?